Nickname: " Big Apple; City that never Sleeps; Gotham"
New York City (officially the City of New York) is the largest city in the United States and one of the world's major global cities. 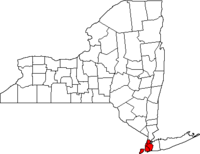 Located in the state of New York, the city has a population of 8,213,839 within an area of 321 square miles (approximately 830 km²), making it the most densely populated major city in North America. With a population of 18.7 million, the New York Metropolitan Area is one of the largest urban areas in the world. New York City is an international centre for business, finance, fashion, medicine, entertainment, media, and culture, with an extraordinary collection of museums, galleries, performance venues, media outlets, international corporations, and financial markets. The city is also home to the headquarters of the United Nations, and to many of the world's most famous skyscrapers. Popularly known as the " Big Apple" and the "City That Never Sleeps", the city attracts people from all over the globe who come for New York City's economic opportunity, culture, and fast-paced cosmopolitan lifestyle. As of June 2006, the city was distinguished for having the lowest crime rate among major American cities. The region was inhabited by the Lenape Native Americans at the time of its European discovery by Italian Giovanni da Verrazzano. Although Verrazano sailed into New York Harbour, he is not thought to have traveled further than the present site of the bridge that bears his name, and instead sailed back into the Atlantic. It was not until the voyage of Henry Hudson, an Englishman who worked for the Dutch East India Company, that the area was mapped. He discovered Manhattan on September 11, 1609, and continued up the river that bears his name, the Hudson River, until he arrived at the site where New York State's capital city, Albany, now stands. The Dutch established New Amsterdam in 1613, which was granted self-government in 1652 under Peter Stuyvesant. The British took the city in September 1664, and renamed it "New York" after the English Duke of York and Albany. The Dutch briefly regained it in August 1673, renaming the city "New Orange," but ceded it permanently in November 1674. 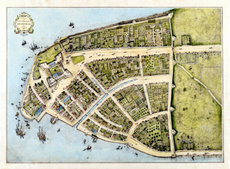 The Castello Plan depicting New Amsterdam on the southern tip of Manhattan, 1660. Under British rule the City of New York continued to develop, and while there was growing sentiment in the city for greater political independence, the area was decidedly split in its loyalties during the New York Campaign, a series of major early battles during the American Revolutionary War. The city was under British occupation until the end of the war, and was not finally evacuated until 1783. New York City was the capital of the newly-formed United States under the Articles of Confederation from January 11, 1785 to Autumn 1788, and under the United States Constitution from March 4, 1789 to August 12, 1790. In the 19th century, the opening of the Erie Canal in 1825 enabled New York to overtake Boston and Philadelphia in economic importance, and local politics became dominated by a Democratic Party political machine known as Tammany Hall that drew on the support of Irish immigrants. In later years, known as the Gilded Age, the city became the first metropolitan American city to transform from one populated by native American citizens of mostly middle class standard to one where the upper classes enjoyed great prosperity and wealth derived from the growth of a poor immigrant working class. This transformation was among the first changes in New York which later spread to other cities and henceforward society in general looked to the city has the cutting edge of change. The transformation of this era was also associated with economic and municipal integration, culminating in the consolidation of the five boroughs in 1898, a consolidation which was repeated in other cities across the country as well. New York's colonial heritage was arguably unique in British North America at the time of the Revolution, since New York was the one metropolitan city of note which started as a non-British colony of Dutch heritage. This heritage was reflected in city's heavy focus on trade, commerce, guild, and civic life which was the hallmark of other Dutch cities. Although by the time of the Revolution, with nearly 80% of it's population of English origin, New York City was virtually uniform as a typical British community, it's Dutch commercial inheritance was crucial in making New York the most important city in North America in the 19th Century once the Erie Canal was built. The War of Independence caused substantial upheaval to this British colonial life. Due to the effects of war and the continual occupation of the city by the British for most of the war, it's population was nearly halved. The battles in and around New York caused significant damage, which was worsened by a suspicious fire that leveled nearly half of the city. Furthermore, once Great Britain recognized the United States and abandoned the city, thousands of Loyalists and the thousands more of troops and their families also left. When General George Washington finally rode in triumph into New York, the city was almost deserted with most of it's upper classes, including its merchants, traders, bankers, and builders gone when they left with the vast British fleet. For the next decade, patriot New Yorkers returned in numbers, and although there was fear of large scale reprisals against the remaining loyalists, the fears were proven unfounded. New Yorks largest newspaper remained owned by a famous loyalist and it became well patronized and funded by the city's re-established patriotic upper-class. Starting in 1800 thousands of mostly New England Yankees moved into the city. Their numbers were such that by 1820, the city had far outstripped it's pre-War population, was largely middle class with a growing upper-class, and was fully 95% of American born heritage. Its economy was a vigorous artisan and craftsman society second to none in the United States while its banking and commercial sectors were fast becoming dominant in the country as a while. From 1800-1840 the city grew in wealth and power and never again would the city have such a substantial stable society of American born citizens. It was into this stable Protestant middle class American society of stockbrokers, guildsmen, bankers, artisans, craftsmen, merchants, shippers, porters, and shopkeepers, and well paid laborers, all operating in an early republican environment of volunteer firefighters, watchmen, and other civic organization that thousands of mostly illiterate unskilled Catholic Irish fleeing the rural depression of their homeland disembarked onto New York City in the 1840's. The social change was an earthquake. Lacking the bureaucratic civic structure of today, the city's infrastructure built as it was an a volunteer network of similar minded individuals collapsed. Partisan networks developed to protect neighborhoods of native Americans from the Irish and vise versa. Crime spiraled out of control as competing ethnic volunteer groups vied for control of the municipal patronage and it's utility networks of fire, sanitation, garbage, and police. For roughly forty years the city was in constant upheaval as riots, civil insurrection, marches and counter-marches, demonstrations and counter-demonstrations swept the old New York city permanently away. In it's place was born the modern city of professional police, fire, and other utility services, traffic control, neighbourhood development, factories, foundries, and the whole panoply of what came to be known as Gotham. As technology, infrastructure and laissez fair capitalism continued to transform the city a series of new transportation links, most notably the opening of the New York City Subway in 1904, expanded the city's environs and bound together the newly-enlarged city of Gotham. Additionally, while immigration spiked and fell between 1842 and 1892, a new wage of immigration began in the late 19th and early 20th centuries which once again transformed the city's demographics. The new European immigration brought further social upheaval, and old world criminal societies rapidly exploited the already corrupt municipal machine politics of Tammany Hall, while local American barons of industry further exploited the immigrant masses with ever lower wages and crowded living conditions. In a city of tenements packed with cheap foreign labor from dozens of nations, the city was a hotbed of revolution, syndicalism, racketeering, and unionization. In response, the upper classes grown fat on the city of Gotham utilized partisan hound-outs, organized crime groups, heavy handed policing and political oppression to smash groups which refused to be coopted. Groups such as the anticapitalist labor union IWW, native American patriot organizations such as the American Protestant Association, and reformers of all stripes were fiercely repressed, while crime lords that became too independent disappeared. Additional demographic changes accelerated when in the 1920s, the city saw the influx of African-Americans as part of the Great Migration from the American South. The Harlem Renaissance blossomed during this period, part of a larger boom in the Prohibition era that saw the city's skyline transformed by construction of the skyscrapers that have come to define New York. New York overtook London as the most populous city in the world in 1925, ending that city's century-old claim to the title. New York City's ever accelerating changes and rising crime and poverty rates ended when World War One disrupted trade routes, the Immigration Restriction Acts limited additional immigration after the war, and the Great Depression ended the need for new labor. The combination ended the rule of the Guilded Age barons. The between the wars period also saw the end of Tammany Hall's eighty years of political dominance with the 1934 election of reformist mayor Fiorello LaGuardia. As the city's demographics stabilized, labor unionization brought new protections and affluence to the workers, the city's government and infrastructure underwent a dramatic overhaul under LaGuardia and his controversial parks commissioner Robert Moses who ended the blight of many tenement areas, expanded new parks, remade streets, restricted and reorganized zoning controls and in short established the city government which is the hallmark of municipalities across the country today. New York City played a major role in World War II as a port and a centre of finance and industry. It emerged from the war as the leading city of the world, with Wall Street leading America's emergence as the world's dominant economic power, the United Nations headquarters (built in 1952) emphasizing its political influence, and the rise of Abstract Expressionism displacing Paris as the centre of the art world. However, the growth of post-war suburbs saw a slow decline in the city's population. A decline in manufacturing, rising crime rates and white flight pushed New York into a social and economic crisis in the 1970s. These problems plagued the city until the 1990s. Racial tensions calmed in these years; a dramatic fall in crime rates, improvements in quality of life, economic growth and new immigration renewed the formerly dying city. 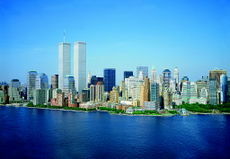 The city was one of the sites of the September 11, 2001 attacks, when nearly 3,000 people were killed in the destruction of the city's tallest buildings, the World Trade Centre. The Freedom Tower, intended to be exactly 1,776 feet tall (a number symbolic of the year the Declaration of Independence was written), is to be built on the site and is slated for completion by 2012. Satellite image showing most of the five boroughs, portions of eastern New Jersey, and the main waterways around New York harbour. New York City is located on the coast of the Northeastern United States at the mouth of the Hudson River in southeastern New York state. The city's geography is characterized by its coastal position at the meeting of the Hudson River and the Atlantic Ocean in a naturally sheltered harbour. This position helped the city grow in significance as a trading city. 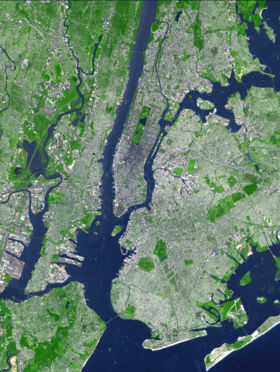 Much of New York is built on the three islands of Manhattan, Staten Island, and western Long Island, making land scarce and driving the city's high population density. Environmental issues are chiefly concerned with managing this density, which is also a factor in making New York among the most energy efficient and least automobile-dependent cities in the United States. The Hudson River flows from the Hudson Valley into New York Bay, becoming a tidal estuary that separates the city from New Jersey. The East River, actually a tidal strait, flows from Long Island Sound and separates the Bronx and Manhattan from Long Island. The Harlem River, another tidal strait between the East and Hudson Rivers, separates Manhattan from the Bronx. The city's land has been altered considerably by human intervention, with substantial land reclamation along the waterfronts since Dutch colonial times. Reclamation is most notable in Lower Manhattan with modern developments like Battery Park City. Much of the natural variations in topography have been evened out, particularly in Manhattan. The city's total land area is 321 square miles. The highest point in the city is Todt Hill on Staten Island, which at 409.8 feet above sea level is the highest point on the Eastern Seaboard south of Maine. The summit of the ridge is largely covered in woodlands as part of the Staten Island Greenbelt. Throughout the boroughs there are hundreds of distinct neighborhoods, many with a definable history and character all their own. 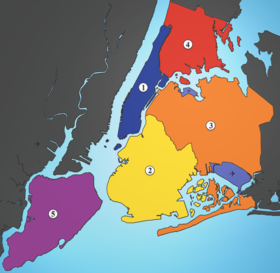 If the boroughs were each independent cities, four of the boroughs (Brooklyn, Queens, Manhattan, and the Bronx) would be among the ten most populous cities in the United States. Manhattan (New York County, pop. 1,593,200 is the business center of the city and the entire country, if not the world. It is also the centre of New York's entertainment and cultural attractions. It is the most superlatively urban of all the boroughs, the most densely populated, and home to most of the city's skyscrapers and famous landmarks. It is loosely divided into downtown, midtown, and uptown regions. Manhattan is the primary "city" of New York City and is most frequently featured in the media as the epitome of the city. The Bronx (Bronx County, pop. 1,357,589) is the birthplace of rap and hip hop culture, as well as the home of the New York Yankees and the largest cooperatively owned housing complex in the United States, Co-op City. The borough has middle-class neighborhoods but also has some of the run-down areas of New York City. Excluding some of its surrounding minor islands, the Bronx is the only borough of the city that is entirely on the mainland of the United States. Brooklyn (Kings County, pop. 2,486,235), the largest borough in population was an independent city until 1898, and has a strong native identity. It is also the only borough outside of Manhattan with a distinguished downtown area. The business district is modern and there are large historic residential neighborhoods in the central and south-eastern areas. There are many well upkept areas, but like the Bronx, some run-down sections of the city are found in Brooklyn. The borough also features a long beachfront and Coney Island, famous as one of the earliest amusement grounds in the country. Queens (Queens County, pop. 2,241,600) is geographically the largest borough and, according to the US census, the most ethnically diverse county in the United States. Prior to consolidation with New York City it was composed of small towns and villages founded by the Dutch. It is home to the New York Mets of Major League Baseball, two of the region's three major airports ( John F. Kennedy International and LaGuardia Airport), and Flushing Meadows-Corona Park, site of the 1939 and 1964 World's Fairs and tennis' US Open. The borough is mainly residential. Staten Island (Richmond County, pop. 464,573) is the most suburban in character of the five boroughs, and has gradually integrated with the rest of the city since the opening of the Verrazano-Narrows Bridge in 1964, connecting it to Brooklyn, an event that caused controversy and even an attempt at secession. It is also connected to Manhattan by the free Staten Island Ferry. Until 2001, the borough was the home of the infamous Fresh Kills Landfill, formerly the largest landfill in the world, which is now being reconstructed as one of the largest urban parks in the United States. Recently, Staten Island is becoming more and more urban to the likes of its sister boroughs. Although located at a more southern latitude than Italian Tuscany or the French Riviera, New York has a humid continental climate resulting from prevailing wind patterns that bring cool air from the interior of the North American continent. New York winters are typically cold and a substantial amount of rain or snow can be expected. At least one blizzard a year is common; this often accounts for a significant percentage of the city's snowfall, since it is far enough away from the Great Lakes to avoid lake-effect snow. Snowfall varies from year to year, but usually averages about 2 feet (60 cm) in total. The Atlantic Ocean helps keep temperatures warmer in the city than in the interior Northeast, sometimes by over 10 degrees (thus, snowfall increases significantly beyond as little as 30 miles north or west of the city, in the Appalachian foothills). However, there has never been a winter since records began in 1869 in which enough snow to cover the ground did not fall at least once. April, May, and November are usually the wettest months. Despite being near the ocean, summers (as well as portions of spring and fall) can be extremely hot and humid. Areas right on the coast may be a few degrees cooler, but the humidity can make it feel just as uncomfortable as in the city. Severe thunderstorms are not uncommon, though tornados have been rare in recent years. Central Park is often referred to as the "lungs of New York." New York's population density has environmental benefits and dangers. It facilitates the highest mass transit use in the United States, but also concentrates pollution. Although gasoline consumption in the city is at the rate the national average was in the 1920s, New York City has some of the dirtiest air in the United States. Pollution varies greatly from borough to borough, and residents of Manhattan face the highest risk in the country of developing cancer from chemicals in the air. Recently, the city has focused on reducing its environmental impact. The city government is required to purchase only the most energy-efficient equipment for use in city offices and public housing. New York has the largest clean-air diesel- hybrid and compressed natural gas bus fleet in the country, and some of the first hybrid taxis. The city is also a leader in energy-efficient "green" office buildings, such as Hearst Tower and 7 World Trade Centre. The city is supplied with water by the vast Catskill Mountains watershed, one of the largest protected wilderness areas in the United States. As a result of the watershed's integrity and undisturbed natural water filtration process, New York City drinking water that originates from this reservoir does not require purification by water treatment plants, and under normal conditions, only chlorination is necessary to ensure its purity at the tap. 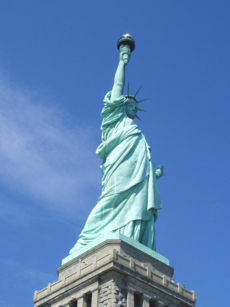 The Statue of Liberty in New York Harbour, a World Heritage Site, has greeted millions of immigrants. New York is the largest city in the United States, with a population about double the next largest city, Los Angeles. According to 2005 New York City Department of City Planning estimates, there are 8,213,839 people (up from 7.3 million in 1990), 2,984,544 households, and 1,802,009 families residing in the city. This amounts to about 40% of New York State's population and a similar percentage of the metropolitan regional population. Over the last decade the city has been growing rapidly. Demographers estimate New York's population will reach 9.4 million by 2025. The two key demographic features of the city are its density and diversity. The city has an extremely high population density of 26,402.9/mi² (10,194.2/km²), about 10,000 more people per square mile than the next densest American city, San Francisco. Manhattan's population density is 66,940.1/mi² (25,845.7/km²). New York City is exceptionally diverse. Throughout its history the city has been a major point of entry for immigrants; the term " melting pot" was first coined to describe densely populated immigrant neighborhoods on the Lower East Side, and according to some estimates as many as one out of every four Americans trace their ancestry roots back to New York City. In 2000, 36% of the city's population was foreign-born; 16% Naturalized citizens, 20% not citizens. Among American cities this proportion was higher only in Los Angeles and Miami. While the immigrant communities in those cities are dominated by a few nationalities, in New York no single country or region of origin dominates. The five largest countries of origin are the Dominican Republic, China, Jamaica, Russia and Italy. The city and its metropolitan area is home to the largest Jewish community outside of Israel. It is also home to nearly a quarter of the nation's Indian-Americans, and the largest African American community of any city in the country. Among Latino New Yorkers Puerto Ricans have long been the city's largest ethnic group, but that has begun to change with new immigration from other Latin American nations. The Irish also have a notable presence; although relatively small in number in contemporary New York, a 2006 genetic survey by Trinity College in Dublin, Ireland found that one in 50 New Yorkers of European origin carry a distinctive genetic signature on their Y chromosomes inherited from Niall of the Nine Hostages, an Irish high king of the fifth century A.D. Another historically significant ethnic group in the city are Italians, particularly southern Italians who emigrated in large numbers from Sicily and Naples in the early twentieth century. New York City has long had a large gay community, estimated to be between 360,000 and 500,000 people. Since 1991, New York City has seen a continuous fifteen-year trend of decreasing crime. Violent crime in the city has dropped by 75% in the last twelve years and the murder rate in 2005 was at its lowest level since 1963: there were 537 murders that year, for a murder rate of 6.57 per 100,000 people, compared to 2245 murders in 1990. New York City is now the safest major city in the United States with a population greater than 1 million and the fourth safest among cities with populations over 500,000. In 2004 New York City had a rate of 2,800 crimes per 100,000, compared with 8,959.7 in Dallas; 7,903.7 in Detroit; and 7,402.3 in Phoenix. While some criminologists credit the continuous drop in crime to innovations implemented by the NYPD in the 1990s, such as CompStat, economist Steven Levitt and others have pointed instead to improved socioeconomic trends. 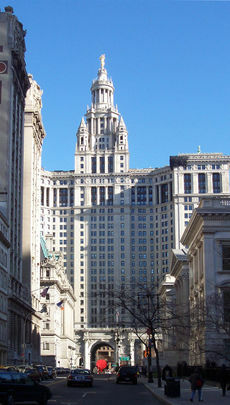 The Manhattan Municipal Building, which houses many city agencies, is one of the largest government buildings in the world. Since its consolidation in 1898, New York City has been a metropolitan municipality with a "strong" mayor-council form of government. The mayor and councillors are elected to four-year terms. The New York City Council is a unicameral body consisting of 51 Council members whose districts are defined by geographic population boundaries. The mayor and councilmembers are limited to two four-year terms. The "Board of Estimates" used to be considered the "upper house" of the city legislature until it was abolished in the early 90's. City Council offices are located at 250 Broadway, adjacent to City Hall. The Democratic Party holds the majority of public offices. 66% of registered voters in the city are Democrats. The party platform centers on affordable housing, education and economic development. Labor politics are important in the city. The city, however, is the most important source of political fundraising in the United States. New York City has not been won by a Republican in a Presidential or Statewide election since 1924. Four of the top five zip codes in the nation for political contributions are in Manhattan. The top zip code, 10021 on the Upper East Side, generated the most money for the 2004 presidential campaigns of both George W. Bush and John Kerry. According to the city government, New York City has a strong imbalance of payments with the state government. New York City receives 63 cents in services for every $1 it sends to the state government in taxes and other revenue (or annually sends $7 billion more than it receives back). The mayor is Michael Bloomberg, a former Democrat elected as a Republican in 2001 and re-elected in 2005 with 59% of the vote. He is known for taking control of the city's education system from the state, rezoning and economic development, sound fiscal management, and aggressive public health policy. In his second term he has made school reform and strict gun control central priorities of his administration. As the host of the United Nations, New York City is also home to the world's largest international consular corps, comprising 105 consulates, consulates general and honorary consulates. New York City is a major centre for international business and commerce and is one of three "command centers" for the global economy (along with London and Tokyo). The city is a major centre for finance, insurance, real estate, media and the arts in the United States. Other important sectors include the city's television and film industry, second largest in the country after Hollywood; medical research and technology; non-profit institutions and universities; and fashion. The New York metropolitan area had an estimated gross metropolitan product of $901.3 billion in 2004, the largest in the United States. The city's economy accounts for the majority of the economic activity in the states of New Jersey and New York. The city's stock exchanges are among the most important in the world. The New York Stock Exchange is the world's largest stock exchange by dollar volume, while the NASDAQ is the world's largest by number of listings. Many major corporations have headquarters in New York; it has more Fortune 500 companies than any other city. New York is also unique among American cities for its large number of foreign corporations. One out of every ten private sector jobs in the city is with a foreign company. Creative industries, like new media, advertising, design and architecture account for a growing share of employment. High-tech industries like software development, game design, and Internet services are also growing; because of its position at the terminus of the transatlantic fibre optic trunk line New York City is the leading Internet gateway in the United States. Manufacturing accounts for a large but declining share of employment. Garments, chemicals, metal products, processed foods, and furniture are some of the principal products. International shipping has always been a major part of the city's economy because of New York's natural harbour, but with the advent of containerization most cargo shipping has moved from the Brooklyn waterfront across the harbour to the Port Newark-Elizabeth Marine Terminal in New Jersey. Some cargo shipping remains; for example, Brooklyn still handles the majority of cocoa bean imports to the United States. 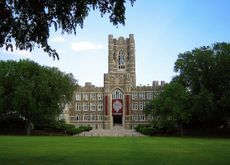 Fordham University's Keating Hall in the Bronx. The city's public school system, managed by the New York City Department of Education, is the largest in the United States. Over 1 million students are taught in more than 1,200 separate primary and secondary schools. New York is also home to many major libraries, universities, and research centers. Much of the scientific research in the city is done in medicine and the life sciences. New York has the most post-graduate life sciences degrees awarded annually in the United States, 40,000 licensed physicians, and 127 Nobel laureates with roots in local institutions. The city receives the second-highest amount of annual funding from the National Institutes of Health among all U.S. cities. Major biomedical research institutions include Memorial Sloan-Kettering Cancer Centre and Rockefeller University. There are 594,000 university students in New York City, the highest number of any city in the United States. The City University of New York, the nation's third-largest public university system, provides post-secondary higher education in all five boroughs. There are also many private universities, including Columbia University, a prestigious Ivy League university established in 1754 and the oldest educational institution in the state, and New York University, the largest private, non-profit university in the United States. The New York Public Library is one of the largest public library systems in the country. Its Library for the Humanities research centre has 39 million items in its collection, among them the first five folios of Shakespeare's plays, ancient Torah scrolls, and Alexander Hamilton's handwritten draft of the United States Constitution. Writer Tom Wolfe said of New York that "Culture just seems to be in the air, like part of the weather." Many major American cultural movements began in the city. The Harlem Renaissance established the African-American literary canon in the United States. The city was the epicenter of jazz in the 1940s, abstract expressionism in the 1950s, and the birthplace of hip hop in the 1970s. Punk rock developed in the 1970s and 1980s, and the city has also been a flourishing scene for Jewish American literature. Wealthy industrialists in the 19th century built a network of major cultural institutions, such as Carnegie Hall and the Metropolitan Museum of Art, that became internationally established. Artists are drawn to the city by opportunity, as well; there are 2,000 arts and cultural non-profits and 500 art galleries of all sizes, and the city government funds the arts with a larger annual budget than the National Endowment for the Arts. The Metropolitan Opera House at Lincoln Centre. The advent of electric lighting led to elaborate theatre productions, and in the 1880s New York City theaters on Broadway and along 42nd Street began showcasing a new stage form that came to be known as the Broadway musical. Strongly influenced by the city's immigrants, these productions used song in narratives that often reflected themes of hope and ambition. Today these productions are a mainstay of the New York theatre scene. The city's 39 largest theatres (with more than 500 seats) are collectively known as " Broadway," after the major thoroughfare that crosses the Times Square theatre district. The Lincoln Centre for the Performing Arts, which includes Jazz at Lincoln Centre, the Metropolitan Opera, the New York City Opera, the New York Philharmonic and the New York City Ballet, is the largest performing arts centre in the United States. 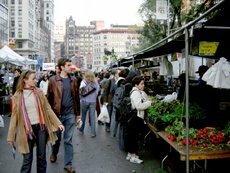 The farmer's market at Union Square. 40 million foreign and American tourists visit New York City each year. 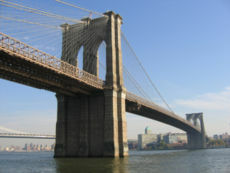 Major destinations include the Empire State Building, the Statue of Liberty, Broadway productions, scores of museums from the El Museo del Barrio to the Intrepid Sea-Air-Space Museum, the Bronx Zoo and New York Botanical Garden, luxury shopping along Fifth and Madison Avenues, and events such as the Halloween Parade in Greenwich Village and the Tribeca Film Festival. Many of the city's ethnic enclaves, such as Jackson Heights, Flushing, and Brighton Beach are major shopping destinations for first and second generation Americans up and down the East Coast. New York City has 28,000 acres (113 km²) of parkland and 14 miles (22 km) of public beaches. Manhattan's Central Park, designed by Frederick Law Olmsted and Calvert Vaux, is the most visited city park in the United States. Prospect Park in Brooklyn, also designed by Olmsted and Vaux, has a 90 acre (360,000 m²) meadow. Flushing Meadows Park in Queens, the city's third largest, was the setting for the 1939 World's Fair and 1964 World's Fair. New York's food culture, influenced by the city's immigrants and large number of dining patrons, is diverse. Jewish and Italian immigrants made the city famous for bagels and New York style pizza. Some 4,000 mobile food vendors licensed by the city, many immigrant-owned, have made Middle Eastern foods such as falafels and kebabs standbys of contemporary New York street food. The city is also home to many of the finest haute cuisine restaurants in the United States. New York is home to teams in each of the major American professional sports leagues. Baseball is the city's most closely followed sport. There have been fourteen World Series championship series between New York City teams; such matchups are called Subway Series. The city's two current Major League Baseball teams are the New York Yankees and the New York Mets, which enjoy a fierce rivalry. The New York Giants and Brooklyn Dodgers were each originally based in New York City before relocating to California prior to the addition of the Mets. Today they compete as the San Francisco Giants and the Los Angeles Dodgers, respectively. New York City is also home to two minor league baseball teams, the New York-Penn League's Brooklyn Cyclones and Staten Island Yankees, which are affiliated with the Mets and Yankees, respectively. In American football the city's teams are the NFL's New York Giants and New York Jets, who share a stadium outside the city limits in East Rutherford, New Jersey. The New York Rangers represent the city in ice hockey, although two other teams are in close proximity of the city, namely the New York Islanders and New Jersey Devils. The National Hockey League is headquartered in Manhattan. New York has a rich basketball history. The first national college-level basketball championship, the National Invitation Tournament, was held in New York in 1938 and remains in the city. Rucker Park in Harlem is a celebrated court where many NBA athletes play in the summer league. New York City's NBA team is the New York Knicks. As a global city, New York supports many events outside the big four American sports, including the U.S. Tennis Open, the New York City Marathon, and many amateur leagues in sports such as soccer, cricket and stickball. The New York Cosmos (1971-1985) was a former franchise in the North American Soccer League, renowned for signing the great Brazilian player Pelé. Red Bull New York, formerly known as the MetroStars, is a professional soccer club based in New Jersey that participates in Major League Soccer. 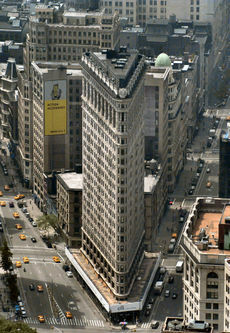 The Flatiron Building is a famous example of Beaux-Arts architecture. 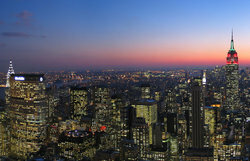 The skyline of New York is one of the most recognizable in the world. New York actually has three separately recognizable skylines: Midtown Manhattan, Lower Manhattan, and Downtown Brooklyn. New York City has architecturally important buildings in a variety of styles, including French Second Empire (The Kings County Savings Bank Building), gothic revival (the Woolworth Building), Art Deco (the Empire State Building and Chrysler Building), international style ( the New School, Seagram Building and Lever House), and post-modern (the AT&T Building). The Condé Nast Building is an important example of green design in American skyscrapers. The residential parts of the city have a distinctive character from the skyscrapers of the commercial cores that is defined by the elegant brownstone rowhouses and apartment buildings which were built during the city's rapid expansion from 1870–1930. Stone and brick became the city's building materials of choice after the construction of wood-frame houses was limited in the aftermath of the Great Fire of 1835. Unlike Paris, which for centuries was built from its own limestone bedrock, New York has always drawn its building stone from a far-flung network of quarries and its stone buildings have a variety of textures and hues. New York is home to the two busiest rail stations in the country, including Grand Central Terminal seen here. New York City is home to the most complex and extensive transportation network in the United States, with more than 12,000 iconic yellow cabs, 120,000 daily bicyclists, subway, bus and railroad systems, immense airports, landmark bridges and tunnels, ferry service and even an aerial commuter tramway. While nearly 90% of Americans drive to their jobs, only about 30% of New Yorkers do; about one in every three users of mass transit in the United States and two-thirds of the nation's rail riders live in New York and its suburbs. Data from the 2000 U.S. Census reveals that New York City is the only major city in the United States where more than half of all households do not own a car (the figure is even higher in Manhattan, over 75%; nationally, the rate is 8%). New York's high rate of public transit use and its pedestrian-friendly character makes it one of the most energy-efficient cities in the country. A study by the environmental organization SustainLane found New York to be the city in the United States best able to endure an oil crisis with an extended gasoline price shock in the range of US$3 to US$8 per gallon. The New York City Subway is the largest subway system in the world when measured by track mileage (656 miles or 1,056 km of mainline track) and the world's fifth largest when measured by annual ridership (1.4 billion passenger trips in 2004). New York City's public bus fleet and vast commuter rail network are the largest in North America. The rail network, which connects the suburbs in the tri-state region to the city, has more than 250 stations and 20 rail lines. The commuter rail system converges at the two busiest rail stations in the United States, Penn Station and Grand Central Terminal, both in Manhattan. Long-haul buses depart from the Port Authority Bus Terminal, the nation's busiest bus station. Three major airports serve New York City and its surrounding suburbs: John F. Kennedy International Airport (JFK) and LaGuardia Airport (LGA), both in Queens, and Newark Liberty International Airport (EWR) in nearby Newark, New Jersey. About 100 million travelers used these New York-area airports in 2005 as the metropolitan region surpassed Chicago to become the busiest air gateway in the nation. Rail service is now available to Kennedy Airport via AirTrain JFK. The service connects with the Long Island Rail Road at Jamaica and the city subway system at Howard Beach. New York City has ten sister cities. The year each relationship was formed is shown in parentheses below.